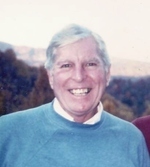 Carl “Bud” G. Heins, age 88, an honorable man who was good for his word, passed away Monday, April 2, 2012 at Kingston of Ashland. On May 21, 1923 in Mason City, Iowa, Mr. Heins was born to the late William W. and Hallie Luella (Zimmerman) Heins. He had been a resident of Ashland Co., most of his life. Mr. Heins was employed for forty years at Westinghouse in Mansfield in various positions. He was a member of the Westinghouse Union and Elks Lodge. Mr. Heins enjoyed antiquing and sold antiques thru the Olivesburg General Store for many years. He was a private entrepreneur, enjoyed playing bingo at the 40et8 and loved to dance and sing. Mr. Heins also enjoyed interacting with and was quite charmed by toddles and taught his family lessons in very few words. He preferred that his children be themselves, use their own instincts, and mold their own lives. On December 22, 1945 Mr. Heins married his first wife, Irma M. Meininger who preceded him in death February 4, 1962, he then married his second wife, Nancy K, Bernard-Boyer. Mr. Heins is survived by his children: Sharon L. (George) Conn of Florida, Peggy G. (John) Sattler, Linda J. (John) Chorpening, Anthony “Tony” E. Heins, Stephanie K. (Craig) Simmons, Steven J. (Mona) Bernard of Oregon, Kristine R. Pandey of Oregon, and Shelly J. (Thomas) Jones; 11 grandchildren; and 6 great-grandchildren. Besides being preceded in death by his first wife, Mr. Heins was preceded by brothers, William, David, Harvey, and James “Jimmy” Heins and a sister, June Crone.